77 Jackpot is one of the online casinos managed by Milga-UK Limited. Since 2009 when it is has been established, 77Jackpot has already gained many loyal players. Clients keep coming back for the company's high quality entertainment and platform. The target audience of the site is mostly high-roller, thus the site maintains its classy and sleek interface design. This gaming site, which is registered and licensed in Montenegro, diversifies its content by offering several games coming from different software providers. The strategy seems to work well as people have a wide array of available games to try on. Games within this website are provided by Betsoft Gaming, Net Entertainment, Greentube, Blue Ocean Gaming, Vivo Gaming and Novomatic. 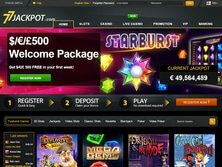 Despite having an assorted software supplier, 77 Jackpots meticulously chooses only the best to display in its site. 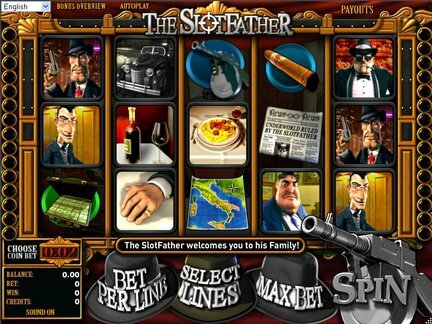 Only the remarkable game selections are featured by 77Jackpot. The collection includes fascinating visuals of craps, baccarat, blackjack, European and American roulette, video poker, keno, and scratch cards. Among the choices are Aliens, Book of Ra, Deuces Wild, Greedy Goblins, Gonzo's Quest, House of Fun, Jacks or Better, Joker Poker, Lucky Lady's Charm Deluxe, Mamma Mia, Mr. Vegas, Poker Heads up Hold'em, Reel of Steel, Robin Hood, Safari Sam, South Park, Starburst, and The Copa. Real time fun is also available as there is a live dealer for craps, Caribbean poker, blackjack, baccarat, and roulette. If these game picks are too overwhelming and you are confuse what to play, try to check out the demo play of each game. The overview will give you an impression to help you decide whether to play it or not. Of course, live games do not have a demo play. Option to play instantly is accessible. The downloadable software installer is not readily available. Meanwhile, there is also a mobile version of this casino so players can wager and enjoy wherever they go. Smartphones and tablets can join the casino games such as Tycoons, A Night in Paris, The Slot Father, and True Illusions. Both iOS and Android platforms are supported. Once you join and create a new account in this site, you are instantly given € 5 free credit. This no-deposit 77 Jackpot bonus, however, has a country restriction so you better check first if you're eligible. Upon making the first four deposits, a player can receive up to € 500 total credits. The first deposit is entitled for 100% increase up to € 200 while the second deposit is entitled for another 100% increase up to € 100. Third deposit is rewarded with 50% increase up to € 100 and lastly, the fourth deposit is rewarded with 25% increase up to € 100. This € 500 worth of 77 Jackpot bonus package is truly attractive. A player must place a bet 40 times to utilize the credits. Make sure to check out the detailed wagering requirements in order to successfully cash out the winnings from these bonuses. Referring a friend has an equivalent incentive too. Once you bring a friend to play in the gaming site, you will be rewarded with € 50 free credits. This 77 Jackpot refer-a-friend bonus lets you expand your social circle while earning money at the same time. VIP programs are also presented in three different categories: Silver Club, Gold Club, and Platinum Club. Loyal players should always be honored with various surprises and prizes. Wager as long as you want and worry no more. Guaranteed cash back of 10% up to € 100 will be returned to you in your first week. Similar with the other promotions, ensure to read and follow all the terms and conditions to effectively take home your cash back. Money transactions in this site are absolutely secured because it uses an up-to-date 128-bit encryption technology. Through this encryption, the player's account information is also kept secured. Banking methods can be made via bank transfer, check, EcoPay, MasterCard, Neteller, PaySafe Card, Skrill, Ukash, Visa, Visa Debit, Visa Electron, and Web Money. US dollars, British pounds, Euros, and Australian dollars are the currencies accepted. A withdrawal process takes a 48-hour holding period and proof of identification. Transactions are handled only on weekdays, Monday to Friday. There is an option to choose your preferred language among the following: Dutch, English, French, German, Greek, Italian, Norwegian, Russian, Spanish, and Swedish. Unfortunately, the site does not accept players from the USA. At any time of the day, you can reach the 77Jackpot's customer service via toll-free phone numbers, email address, online web form, and live chat feature. For VIP players, they are assigned with their own personal VIP host to assist them whenever necessary. Some of the complaints against this site are the poor payout rate and alleged fake games. A customer accused the site for copying and faking a Net Entertainment game. As a resolution, 77Jackpot removed the game from their site. Aside from these comments, most of the feedback for 77Jackpot is positive so we will be giving them 5 out of 5 for the great experience.